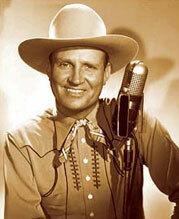 From his first hit "That Silver-Haired Daddy of Mine," which received the first Gold Record ever by any artist, to the Christmas classic "Here Comes Santa Claus (Right Down Santa Claus Lane)," Gene Autry’s recording career spans multiple decades and a variety of musical genres. This page will soon feature detailed information on America’s Favorite Singing Cowboy’s discography, awards, and music releases. 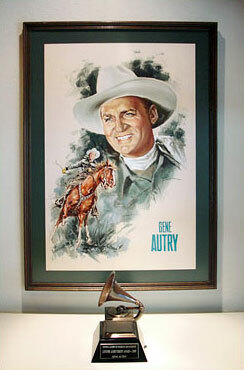 On February 7, 2009 Gene Autry was honored with the Recording Academy's Lifetime Achievement Award at the Grammy's Special Merit Awards Ceremony. Read more in our News Archive section here. 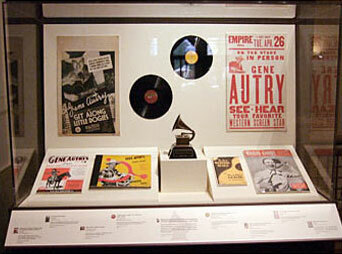 In March of 2009 the Autry Museum had a special cameo exhibit of Gene Autry's National Academy of Recording Arts & Sciences Lifetime Achievement Award plus other artifacts relevant to Gene's music career. See photos from the installation here.